This Companion to Greek and Roman Historiography reflects the new directions and interpretations that have arisen in the field of ancient historiography in the past few decades. Comprises a series of cutting edge articles written by recognised scholars. 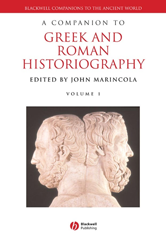 Presents broad, chronological treatments of important issues in the writing of history and antiquity. These are complemented by chapters on individual genres and sub-genres from the fifth century B.C.E. to the fourth century C.E. Provides a series of interpretative readings on the individual historians. Contains essays on the neighbouring genres of tragedy, biography, and epic, among others, and their relationship to history.